There are currently 3,301 users on this website. do we have some thailand stamp experts here, whom I could asked about their opinion pertaining specific siam stamps ??? Welcome to the forum. Just post the pictures - someone will ring in ! lot 108 kiss or double overprint ???? lot 254 overptint omitted 100 % or not ??? lot 108,141 is described as double overprint...Lot 254 is described as overprint missing. lot 254 the overprint is described as almost totally missing, although I caanot detect any residues of ink on the captioned stamp. that is the mystery and thats why I did not buy the stamps. Can you post a pic of a double kiss overprint? So we can understand the difference. The Lot #108 stamp you illustrate is a double print by my standards and is similar to other known examples. Some differentiate by the distance between strikes and this seems to be enough for me. Also, there may be an impression from the steel font that shows through on the back of the stamp (which can not be detected from just a scan) which could have been a second factor supporting a }double overprint" to an expert like Brandon. Each collector should set his own definitions - but commercially, it is a double overprint. 2. what about lot 141,254 www.eurseree.com sale 52 do the description match in your opinion or do they diviate especially lot 254 I think the overprint on the stamp is a 100 % omitted ??? @perf12 thk you very much for yr support. 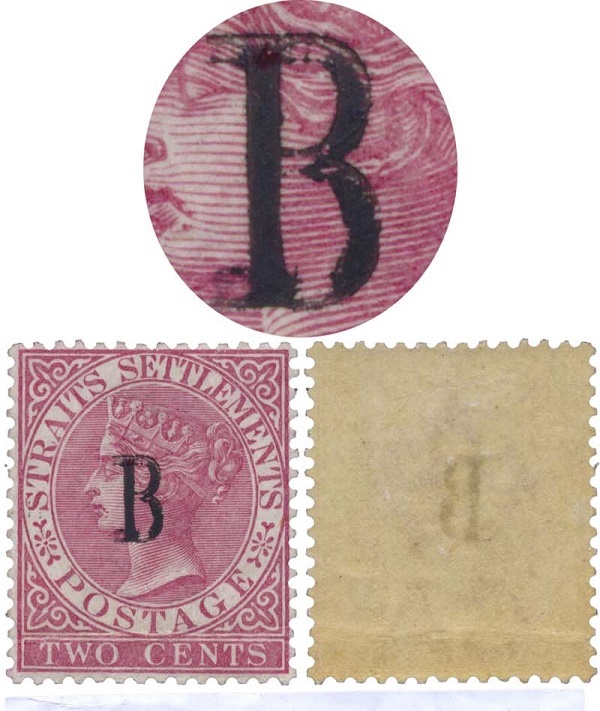 In my opinion lot #141 is a genuine variety, double English numeral "1", one inverted. A combination of known varieties listed in my 40 year old catalog of Siam Postage Stamps to 1940 as #25d and #25e, but this on same stamp. This variety was missing in both the Walter Pears and Henry Madden collections. I have seen only one example of it. I think it is genuine, very rare and important. I am not so fond of lot #254 and it does not "feel" right to me (lightened postmark in the area as well as lightened top of "S" at left , but not missing, suggest that it may have been manipulated). I do not like to say negative things without viewing in the flesh but have seen some problems with the missing surcharges on that issue. 1. thk you very much for yr great expertise. I have yr catalog and also peter c.preuss compendium about siam stamps. 2. I will buy both lots 141 and will ask for a discount on lot 254 I consider usd $ 700 a fair price. what do you think ??? 3. last question lot 141 no. 21 var mirrored "1" on catalog sales 52 www.eurseree.com, whats your opinion on that stamp ?? ?